Ronan Burke Photography is an independent family run wedding photography business based in Edinburgh, Scotland. We aim to provide contemporary, fun and relaxed wedding photography, carried out with a minimum of fuss and inconvenience while providing you with an unforgettable memory of the greatest day of your lives. Ronan works with and listens to the bride and groom thus ensuring he captures all the fun, detail and quiet moments today's brides are looking for. We are proud of our reputation for quality, service and value for money and are one of the most competitive photographic companies in Central Scotland. We promise not to compromise quality, to only use the very best professional grade materials and to offer outstanding value for money. 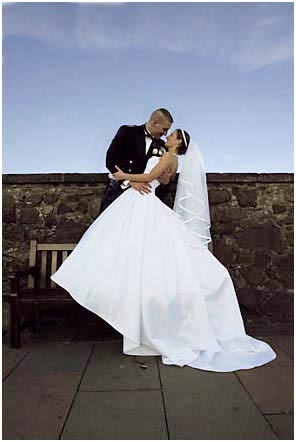 We are members of the British Professional Photographers Association and the Soceity of Wedding and Portrait Photographers. Click on the image to enter the site where you can browse portfolios from recent weddings, you can check prices and available dates and you can contact us. OurWeddingMemories.co.uk - UK Wedding Photographers!